Book six of the Memory of Flames series picks up right from the moment book five – Dragon Queen ends. This time we’re in the ruined aftermath of Zafir’s ride to destroy the city of Dhar Thosis and Baros Tsen T’Varr is contemplating the ruination of his plans. This is not a book to read without the rest of the series as there are references to all sorts of things from across the other stories. Once again, it has a swollen quality to it, but for different reasons. Deas is trying to pull together the vast tapestry of his epic, preparing for its eventual ending in The Storm Kings and there’s a lot of mythology to explore if all the pieces of the jigsaw are to fall into place. We start slow, a good chunk of the story given over to reflection and speculation over what is to come. This is made palatable by the cast of characters at the Eyrie. We’ve spent time with most of them and the varying ambitions and agendas of each as they flee and expect retaliation. Once again, we have the counter story of Tuuran and Crazy Mad (Berren the Bloody Judge). Whilst this improved towards the end of Dragon Queen and is strongly written at the start of this book, once again, the wanderings of these two feel aimless, until they become the needed plot device for the series conclusion. We know something of Crazy Mad’s nature now and more is revealed as the story moves on, but the confused quality of him is reflected in the fitful decision making of the pair. Neither character is particularly engaging, although Tuuran’s prior relationship with Zafir offers some interest to see how this might develop and how both Adamantine man and Speaker may react differently to their nature owing to what they shared. Much like Zafir’s entrance to the previous book, the introduction of the Arbiter, Red Lin Feyn and her investigation into the destruction of Dhar Thosis stiffens and focuses the plot. However, this is where book can be directly compared to its predecessor and The Splintered Gods comes off the better of the two, possibly because Deas is trying to move towards a resolution to the series and we have a deeper relationship with his cast. At this point, there are comparisons to make with the other popular dragon writer of fantasy, Anne Mccaffrey, whose Pern novels forged a path for dragons in the eighties and nineties. It is clear much has changed in the genre since then. Deas’ monsters are far more dangerous and his plotting brings detailed conflict with consequences. There is less of a binary in his story, with shifting alliances and schemes throughout, where the same ideas in Mccaffrey’s work were anomalies, quickly corrected toward a formula. However, the Pern novels were a journey of discovery, gradually revealing more of the mysterious origins of humans, dragons and Thread. Memory of the Flames spends a lot of time trying to weave its mystery around us. Granted, Deas is sticking to a fantasy premise, but the complications of the shattering of worlds and gods make for long paragraphs with references to ideas and concepts that are drawn from the earlier books. The density of this, couched as it is in the appropriate epic tone, distracts from the gathering story of this novel in favour of the series arc. The conclusion erupts in a habitual conflict between the different sides. Dragon verses magical technology again, with the added spice of an awakening god enslaving mortals to do his bidding. There is a certain amount of contrivance in play here to bring everyone together in the same space and readers of the series will be aware of what to expect, although it is always interesting to see the angle Deas will generate the conflict from. In this case, we have a most interesting twist with the Arbiter and confusions of identity. Certainly, the most memorable element of the book is Red Lin Feyn and we hope her story will continue in the final instalment – The Storm Kings. 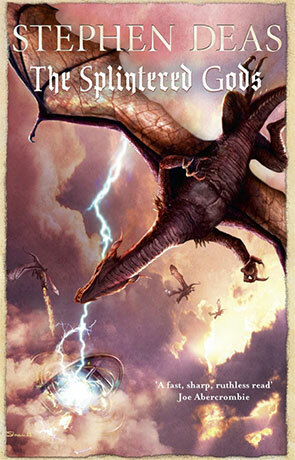 The Splintered Gods is a book for fans of this series and as such well worth the time and investment. We’ll miss Deas and his dragons when he puts down his pen and moves on to something else. Written on 31st March 2016 by Allen Stroud.